As we have already discovered in the introduction, the evolution of a star can be a complicated subject. Luckily there is a way to sort through this and create some guidelines. Both categories of stars may begin the same, but their ends are dramatically different. A low mass star is any star that is less than 2.2 Solar masses. Any star that has more mass than 2.2 Solar masses is a high mass star. We have already introduced the concept of Jeans Mass and Jeans Length that places restrictions on the size of cloud prior to collapse. Now the overall mass of the cloud being contracted will dictate the soon-to-be stars place on the Main-Sequence. The diagram demonstrates that normal stars like our Sun exist on what is called the Main Sequence. Other stars populate other areas based on the energy they produce and their luminosity. But before we look at fully formed stars, we have to examine the early history of proto-stars. The image on the left shows a molecular cloud that has collapsed to the point that a central proto-star is now producing some heat and energy, not enough to fuse hydrogen atoms, but enough to flatten the cloud and eject disk material (the green trail) away from the cloud. some of this energy goes as magnetic bands form close to the star. The energy from the rotation is now being transferred via magnetic lines. However, the heat of the proto-star continues to rise. High speed jets create interstellar shock waves like the image above. This is called a Herbig-Haro object. The effect is the result of ionized oxygen and carbon. The winds creating these objects can be anywhere between 20 km/s to almost 500 km/s. The name of the central object during these stages changes from proto-star to Young Stellar Object. While the jets continue to expel disk material, the Young Stellar Object (YSO) becomes visible and the name changes again to a T-Tauri star. This stage continues until hydrogen fusion initiates. The point of separation between low mass and high mass stars is in the mass of the cloud itself. 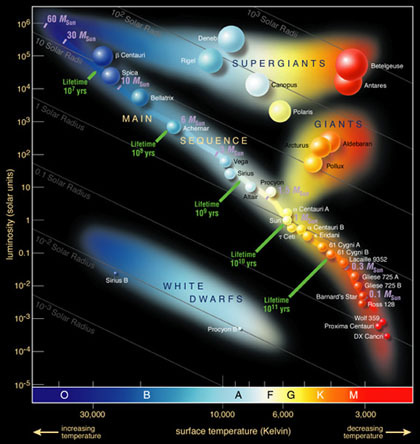 By studying groups of YSO's and T-Tauri stars, Astronomers have been able to theorize positions that new stars take on the Hertzsprung-Russell diagram (hereafter known as the H-R diagram). 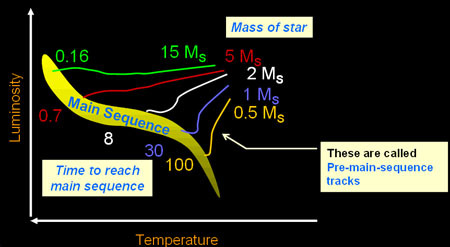 The Hayashi Track, named after Chushiro Hayashi after extensive work in stellar evolution, demonstrates where a T-Tauri star will enter the Main Sequence. "Live fast and die young." Of special note, the point the star enters the Main Sequence, it is called a Zero Age Main Sequence star, or ZAMS. Our stars have now entered the Main Sequence phase. Nuclear fusion has begun in the core of the star and is radiating and/or convecting its energy to the surface atmosphere. Once on the Main Sequence, both low mass and high mass stars create their energy through the Proton-Proton Chain. It takes awhile for some of this reaction to take place, and as a result has quite a bit of time before expending the core hydrogen. Notice how the O type star resides on the Main Sequence for only a million years compared to a star like our Sun. Once a star initiates shell hydrogen burning, this marks the Main-Sequence Turnoff Point. At this point, low mass and high mass stars evolve a bit different.